nutmeat! Dry it and use it. You will never – I say NEVER – find anything like it to buy, be it in a regular grocery or health food store. Of that I am (almost) completely certain. I guess that's just common sense since this is homemade, but I have to say it is the most nutty “milk” I have ever tasted. It’s amazing. You will want to make more as soon as it’s finished. Guaranteed. Unlike milk from animals, nut milk does not contain cholesterol or lactose, making it perfect for anyone who suffers from conditions that are aggravated by them. It goes without saying it is 100% vegan as well. Almond milk was well known during the Middle Ages throughout both the Christian and Islamic worlds. Since it was non-dairy it was suitable to be consumed during religious fast times. Recipes exist today from as early as the 1300s. Up until the 1800s it was quite common for milks to be made from blanced, pulverized and soaked nuts. Blancmange is a famous dessert that, at least originally, used almond milk as its base. After blending, in the morning. That's a 2L jug. Every grocery store has almond milk for sale in the organic or “health” section. I have often looked at the chocolate almond and thought “how horrible is that?”. I may have to rethink my position. I am looking at the back of an empty store-bought almond milk container right now. It contains the usual (almonds) but also gum, carrageenan and lecithin thickeners. I’m assuming that means they thin it substantially and there is far less almond in it than in my recipe. 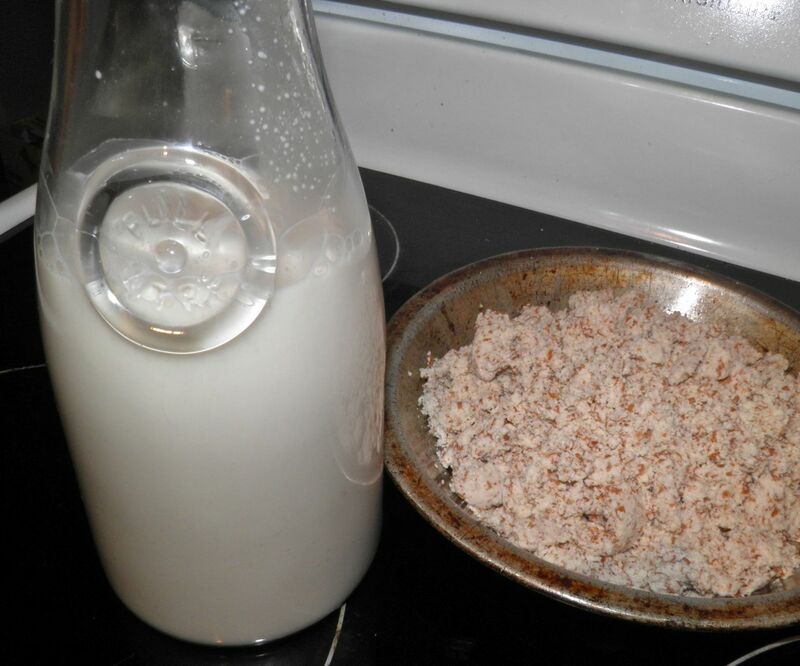 By the same token, since there are no stabilizers in homemade milk you will have to shake it before drinking. No biggie. Manufacturers say to shake the store-bought milk too. This is really good stuff. Almost all of the time is for soaking the nits. I would say at least 31 of the 32 hours. The overnight soak swells the almonds, and then the refrigerator time allows the mixture to “bloom.” “Leach” is another word, but is far less appetizing sounding. I was completely blown away by the taste of this. Before the addition of the sugar and salt it was pretty bland. They both brought out the almond taste exceedingly well. Don’t throw away the leftover nut meat. Dry it in the oven and grind it into flour with your food processor. This afternoon (or later this morning) I’m going to be making almond bread by substituting it 3-1 with flour. You have to try this recipe. Seriously – you have to try it. It will change your mind about nut milks entirely. I may have to try almond coconut soon. I can see it coming. Like it says on the side of the store-bought almond milk: "Taste the WOW." My recipe is "wow-er." 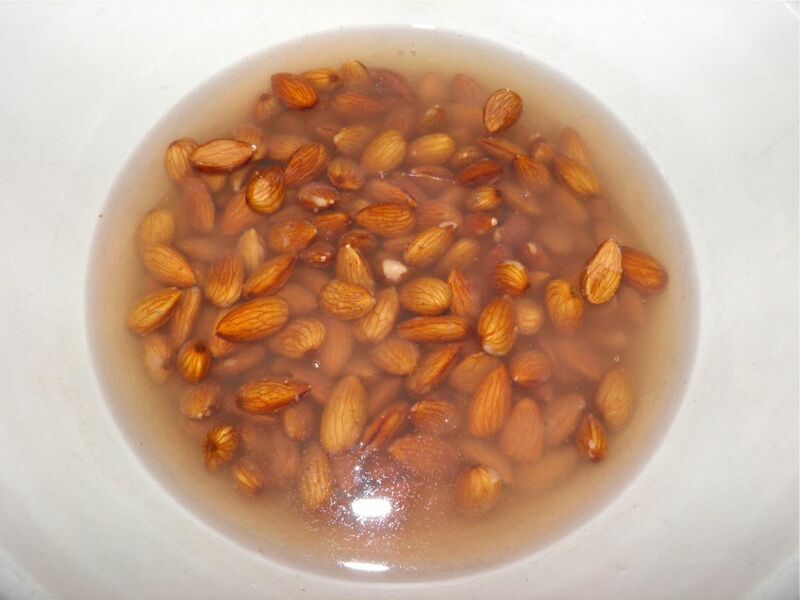 Soak the almonds in the 3.5 cups of water overnight in a bowl. 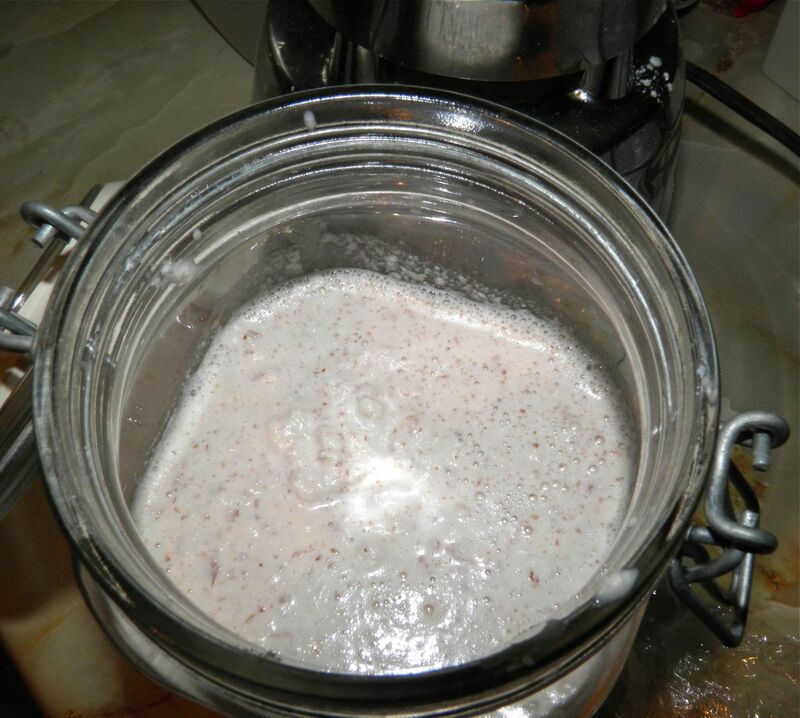 In the morning, purée the nuts and water in a blender until as smooth as you can get it. 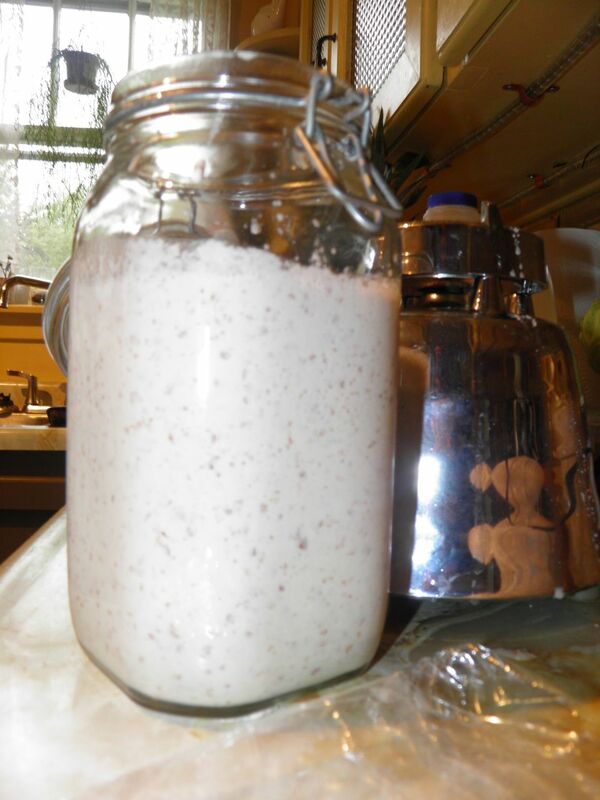 Place in a sealed container in the refrigerator for 24 hours. This is the “blooming” period. 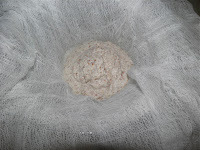 The next day, place small amounts of the mixture in a 4-layer thick piece of cheesecloth. Gently squeeze out as much liquid as you can. If you squeeze too hard you may break the cheesecloth. This is first-hand knowledge. Squeeze only about 1/2 cup at a time. 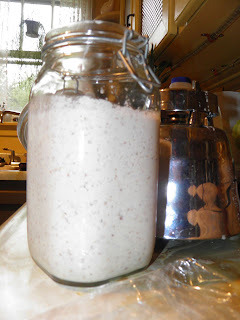 The resulting “squeezin’s” will be very milky and almost completely grit-free. If it isn’t you can pass it through cheesecloth again, or fine cotton. 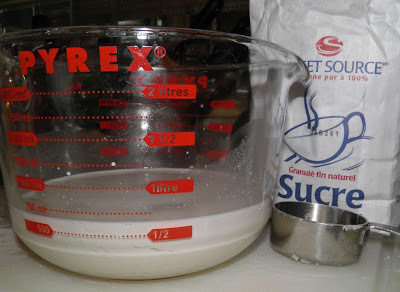 Place the milk in a 1 L measuring cup. You will probably have between 2.5 and 3 cups liquid. Add the sugar and salt and taste. It will be very nutty. Top up to the 1 L mark (or 4 cups mark) with more spring water. Stir well, refrigerate and then use. You can also leave the milk un-thinned for coffee or tea. * 2 weeks later I made this same recipe but using blanched almonds with no skin. As you would imagine the colour was whiter. I also stretched it a little more by adding enough water to make 1.5 L. Every bit as good, if a little thinner and not quite so rich! add water to make the 1 L! Great to know -- I previously thought I'd need a special grinder. This sounds do-able. Historical info. is further incentive to try it.